Philip Broadbent is Assistant Professor in the Department of Germanic Studies at the University of Texas at Austin. He has published on literary representations of post- 1990 Berlin and contemporary European fiction. His current book project looks at the emergence of cool aesthetics in West Germany. Sabine Hake is the Texas Chair of German Literature and Culture in the Department of Germanic Studies at the University of Texas at Austin. 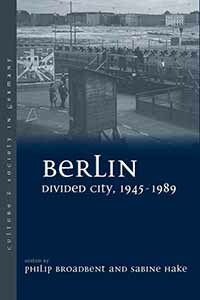 She is the author of six books, including Topographies of Class: Modern Architecture and Mass Society in Weimar Berlin (2008) and Screen Nazis: Cinema, History, and Democracy (2012), and has published numerous articles and edited volumes on German film and Weimar culture.